Signed from prominent Grangemouth junior club Forth Rangers, Archibald Jack was a promising Outside-Left who Falkirk signed at the beginning of the 1913/14 season, but who seemed to have made a good enough impression in his first two reserve matches to be given a shot in a relatively minor match for the first team. 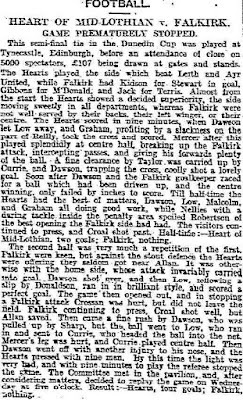 Jack made his full Falkirk debut against Hearts in the Semi-Final [2nd Rd] of the Dunedin Cup [the Dunedin Cup if you didn't know was a Cup for Edinburgh clubs, plus for some reason never explained Falkirk & Raith Rovers], and Falkirk got a pasting, but luckily for the club with nine minutes to play, the referee stopped the game because of bad light [Falkirk won the 'replay']. 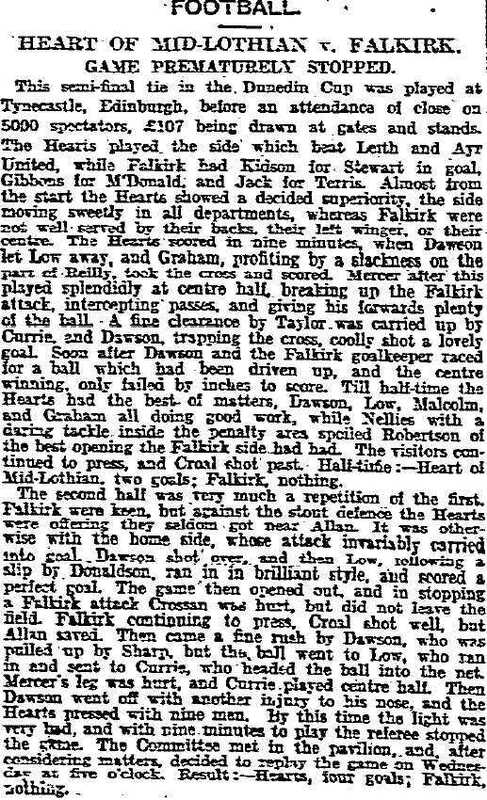 But, this was not the reason he made so few appearances for the club, it was mainly because Falkirk stuck with Robert Terris at Outside-Left [a move vindicated by the fact that Liverpool signed Terris in February] and already had a replacement for Terris in William Lennie of Aberdeen. So Archie played out the season in the reserves, winning the Stirlingshire Consolation Cup [Final held over from 1912/13], and being a Runner-Up in the Stirlingshire Cup, making only occasional first team appearances when Terris or Lennie were indisposed, before moving on to Armadale at the end of the season. After a season and a bit with Armadale he moved on to Leith Athletic until he was called up for the war effort. 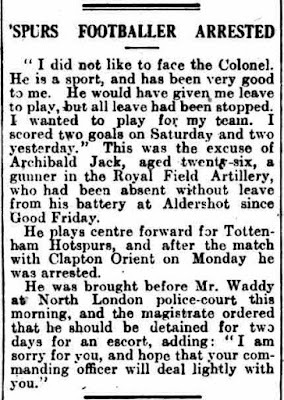 It was while he was at Aldershot that he seems to have played occasionally with Tottenham [and indeed it seems preferred playing football to messing about with that army business. 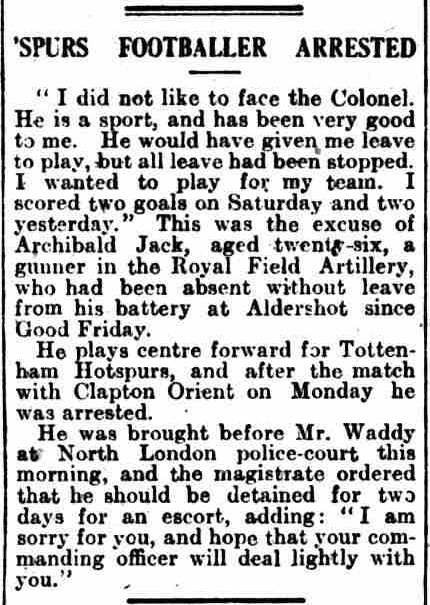 I cannot find much information about his time at Spurs [English Football Historians do not seem to pay much heed to their wartime football for some reason], nor have I found any documentation from his time in the army: after Spurs he moved on to South Shields for a time before seemingly drifting off the footballing map. It was only because I recognised his name whilst checking through Grandsable Cemetery that I was able to confirm that it was him from the papers. Known Career – Forth Rangers, Falkirk [1913/14], Armadale [1914/15-1915/16], Leith Athletic [1915/16-1917/18], Tottenham Hotspur [1917/18-1918/19], South Shields [1919/20].